This photo was planned in advance of the wedding based on a concept that the bride and groom brought to us. It sounded fun, and the result is pretty darn cool, I must admit. 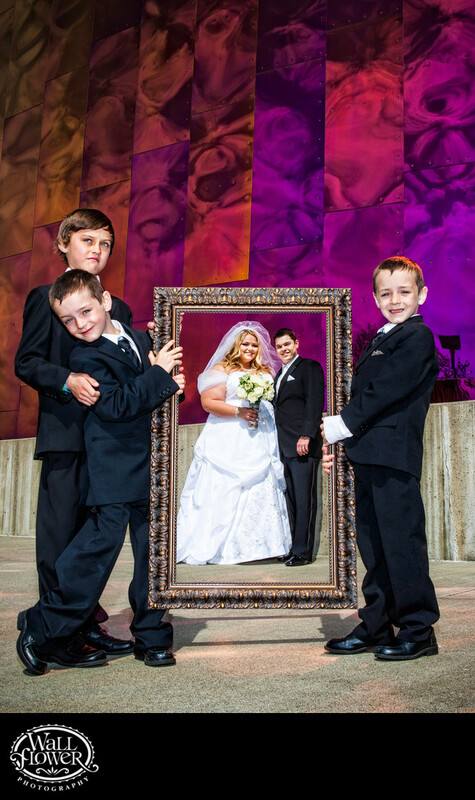 The three ring bearers (the bride's nephews) holding the frame were hilarious to work with, and we got the bride and groom framed just right in the end. The setting we chose for this photo is an external wall of the Experience Music Project (EMP) museum, right next to the Space Needle, which is reflecting a cloudy sky in the coolest way possible.